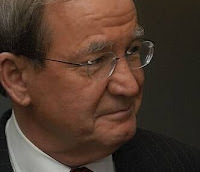 SUNLIT UPLANDS: Pat Buchanan: Is the Spectre of Trump Haunting Davos? Pat Buchanan: Is the Spectre of Trump Haunting Davos? The lights are burning late in Davos tonight. Evidence of a nationalist backlash, said Biden, may be seen in the third parties arising across Europe, and in the U.S. primaries. But set aside Joe’s slurs — demagogues, xenophobia. Who really belongs in the dock here? 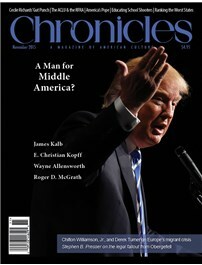 Who caused this crisis of political legitimacy now gripping the nations of the West? Was it Donald Trump, who gives voice to the anger of those who believe themselves to have been betrayed? Or the elites who betrayed them? Can that crowd at Davos not understand that it is despised because it is seen as having subordinated the interests of the nations and people in whose name it presumes to speak, to advance an agenda that serves, first and foremost, its own naked self-interest? The political and economic elites of Davos have grow rich, fat and powerful by setting aside patriotism and sacrificing their countries on the altars of globalization and a New World Order. No more astute essay has been written this political season than that of Michael Brendan Dougherty in “This Week,” where he describes how, 20 years ago, my late friend Sam Francis predicted it all. What we saw through a glass darkly then, we now see face to face. Is not Trump the personification of the populist-nationalist revolt Francis predicted? And was it not presidents and Congresses of both parties who mired us in wars in Afghanistan, Iraq, Libya, Syria and Yemen, and negotiated the trade deals that have gutted American industry? The bleeding of factories and manufacturing jobs abroad has produced the demoralization and decline of our middle class, along with the wage stagnation and shrinking participation in the labor force. Is Trump responsible for that? Is Socialist Bernie Sanders, who voted against all those trade deals? If not, who did this to us? Was it not the Bush Republicans and Clinton Democrats? Americans never supported mass immigration. It was against their will that scores of millions, here legally and illegally, almost all from Third World countries, whose masses have never been fully assimilated into any western nation, have poured into the USA. If the West embraces, internalizes and operates on the principles of liberalism, Burnham wrote, the West with meet an early death. Among the dogmas of liberalism is the unproven assumption that peoples of all nationalities, tribes, cultures, creeds can coexist happily in nations, especially in a “creedal” nation like the USA, which has no ethnic core but rather is built upon ideas. A corollary is that “diversity,” a new America and new Europe where all nations are multiracial, multiethnic, multicultural and multilingual, is the future of the west and the model for mankind. Yet, large and growing minorities in every country of Europe, and now in America, believe that not only is this proposition absurd, the end result could be national suicide. And when one considers the millions who are flocking to Trump and Sanders, it is hard to believe that the establishments of the two parties, even if they defeat these challengers, can return to same old interventionist, trade, immigration and war policies. For Trump is not the last of the populist-nationalists. Given his success, other Republicans will emulate him. Already, other candidates are incorporating his message. The day Francis predicted was coming appears to have arrived. Angela Merkel may have been Time’s Person of the Year in 2016, but she will be lucky to survive in office in 2017, if she does not stop the invasion from Africa and the Middle East. To be a reactionary means simply to be alive, because only a corpse does not react any more — against the maggots teeming on it.